If you’ve lived in Richmond for a bit, you’ve probably heard of Nate’s Taco Truck. I’ve never actually been to this taco truck, but that didn’t stop be from being excited about checking out “Don’t Look Back”… the taco place born from Nate himself. I’m not sure why I get so excited about these things but I do. Don’t judge. You would get excited too. I talked a couple of friends into going with me last Friday, and even though we didn’t make it there until after 10 (when the menu becomes more limited) they were still serving tacos, so I was in luck. The menu appears to be pretty limited anyway, so it’s not like we were missing out on a lot of other options. The tacos come “Traditional” or “Gringo” (Traditional is just cilantro, onion, and lime, where as Gringo has cheese, lettuce, sour cream and salsa.) I got traditional, of course. The guys had to deal with me walking around the restaurant trying to find good lighting. Don’t worry boys, I found it. Sorry for being annoying. I actually didn’t like the seitan taco that much, but it’s not really any fault of the restaurant. It had a really “meaty” taste, which I assume most people would enjoy. But to me, it felt like I was eating some kind of mock-chicken stuff. You know what I mean? However, the TVP taco was excellent. Seriously, so good. It goes without saying that I enjoyed having an option that wasn’t just beans and cheese, but this one was extra delicious. They really nailed it with the spices and texture. Vegetarians- go try this. Meat eaters- stop judging the acronym. P.S. Did you miss the latest event announcement? Be sure to email/tweet/comment/something to let us know you’re coming! It’s going to be a fantastic group of bloggers! Today’s guest post comes from Stephanie of Onion Cloute, a local Richmond blog. If you’re wondering what that is… “An onion cloute is a “studded” or “nailed” onion traditionally used to flavor the classical French sauce Bechamel.” For great recipes and culinary adventures, be sure to check out her blog! Mr. Ganz went to the doctor this week and was told sternly to lay off the cholesterol. Apparently his numbers are “shockingly high,” a phrase I don’t think doctors should just go around dropping on their patients. Clearly we’re gonna have to make some changes to our diet to get his levels more reasonable. Don’t get me wrong, I love a challenge. I like to think of dietary restrictions as a type of game, working around them in order to “win.” I’m fortunate enough to be able to eat anything, though perhaps I shouldn’t – Among some friends, I’m known for the odds-defying things I can eat. I once ate a crab rangoon that I found in the backseat of my boyfriend’s car. These were zanier times, but you get the point. So when someone brings a dietary restriction to me, I like to explore it and figure out how to best it. Never so much has this been the case as right now, as I share most of my meals with Mr. Ganz, and in true “My girlfriend’s a vegetarian, which pretty much makes me a vegetarian” fashion, big changes to his diet will affect me directly. To the internet! I spent a couple hours browsing recipes, web md, and anything else that seemed relevant (ok, so I was on pinterest for a half hour) to give myself a crash course in cholesterol. I had a bit of memory stored actually (who knew?) from culinary school – I remembered that the bad cholesterol comes from animal protein, that eggs and shellfish were major cholesterol culprits, and that there were certain foods – like oatmeal and salmon – that could actually help lower cholesterol. 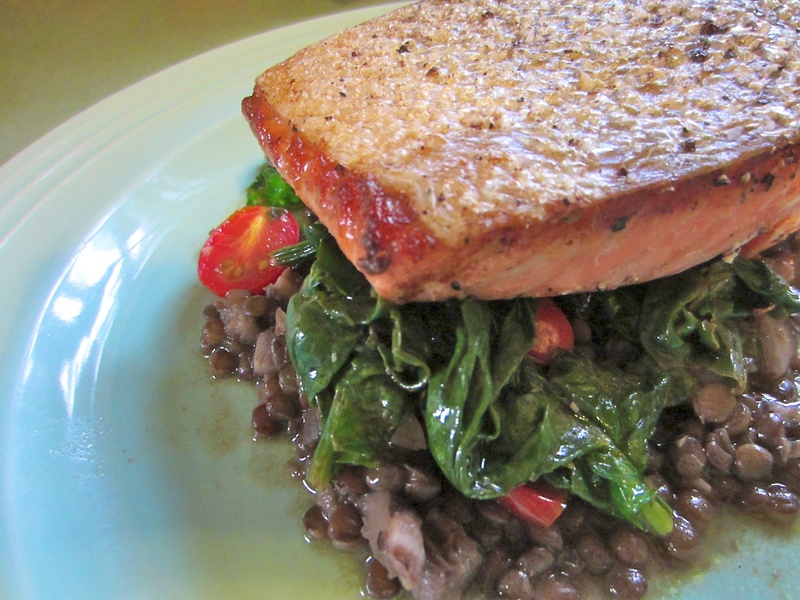 From there, I began to develop some recipes, the first of which was this Crispy Skin Salmon with Lentils and Spinach – a rich, buttery-without-butter dish that, served with a salad, left Mr. Ganz and I satisfied and confident that we had indeed won a battle against high cholesterol. In a medium sauce pan, heat a few glugs of olive oil and the minced garlic over medium heat. Add mushrooms, and stir to combine. Cook mushrooms and garlic for about 2 minutes, and add lentils, thyme, water, salt and pepper. Simmer on medium/medium-high heat for about 20 minutes with the lid slightly askew. Preheat oven to 350. Pat salmon fillets dry, and season with salt and pepper. In a saute pan, heat a couple tablespoons of olive oil over medium high heat. Add salmon, skin side down, and cook for about 3 minutes. Flip fish and move to the oven to cook for approximately 10 more minutes. Meanwhile, heat a bit of olive oil in a saute pan with cherry tomatoes and garlic. Listen for them to begin to sizzle. Add spinach, and toss to combine with oil, garlic, and tomatoes. Add a squeeze of lemon, salt and pepper, and allow spinach to wilt off of the heat. Remove salmon from pan, and drain a bit on a paper towel if necessary. Plate over lentils and spinach. 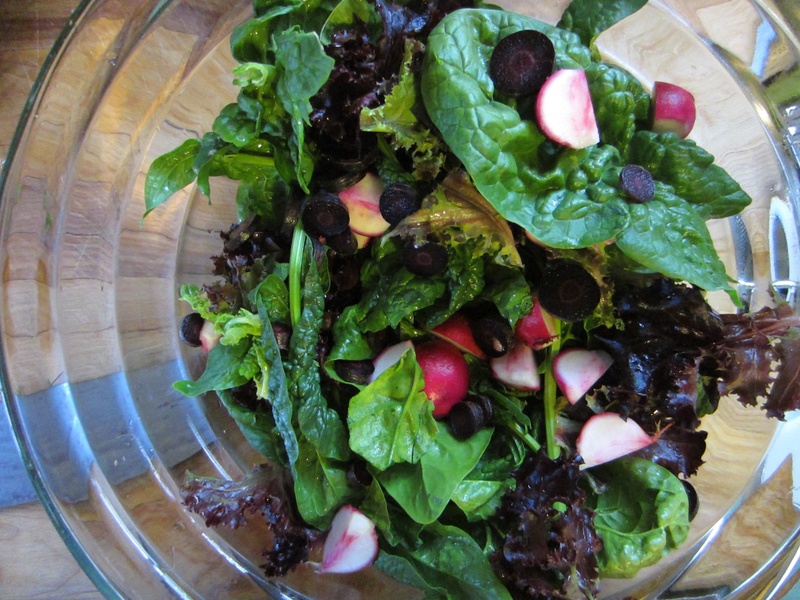 Enjoy with a crisp salad (Ours was mixed greens, purple carrots, and baby turnips with a little balsamic vinegar.) and a glass of wine. Boom, cholesterol defeated. Keep checking back for more cholesterol-fighting recipes – It’s sure to become a regular feature!